Great minds must think alike Sylvie. I made a tasty pot of this the other day as well. It is a great warmer upper on these cold frigid days!! Yours looks delicious! This has always been my favourite soup - my parents called it 'green soup' to disguise the vegetable content! 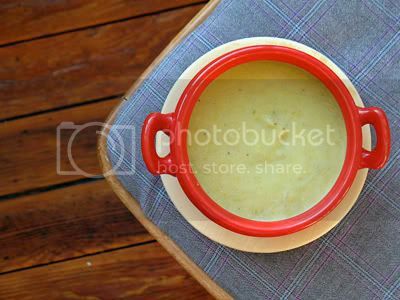 There's nothing better than a nice hot bowl of leek and potato soup with a hunk of bread and cheese. I agree there is nothing like a frosty Winter's day, a bowl of homemade soup and a lovely log fire, except perhaps a lovely Summer's day, sunshine and a bowl of strawberries from the garden - well, I can dream! So with no money now for the 4th week in a row we need it to go away in Telford at least! I love the snow when I'm indoors =) it's just a pain to go to work in this kind of weather. I pretty much eat soup for lunch most days. Love your soup! You have really nice recipes! I am glad that I've discovered your blog:)! This is one of my favourite soup recipes that I make time and time again. It is simple, yet delicious, exactly the way cooking should be. Thanks for this wonderful addition to my collection.